The Agriculture Bill is part of the Government’s Brexit preparation. As the UK leaves the EU, British farmers will no longer be able to receive EU subsidies and will not have to comply with a number of regulations. However, it is likely that they will require financial support. The Bill brings together agriculture and the environment in a legal framework thereby recognising the close links between these areas. It had its first reading in the House of Commons on 12 September 2018. The Agriculture Bill, once enacted, will provide the framework to allow UK agriculture to live without the current support system coming from the EU as part of the Common Agriculture Policy (CAP). 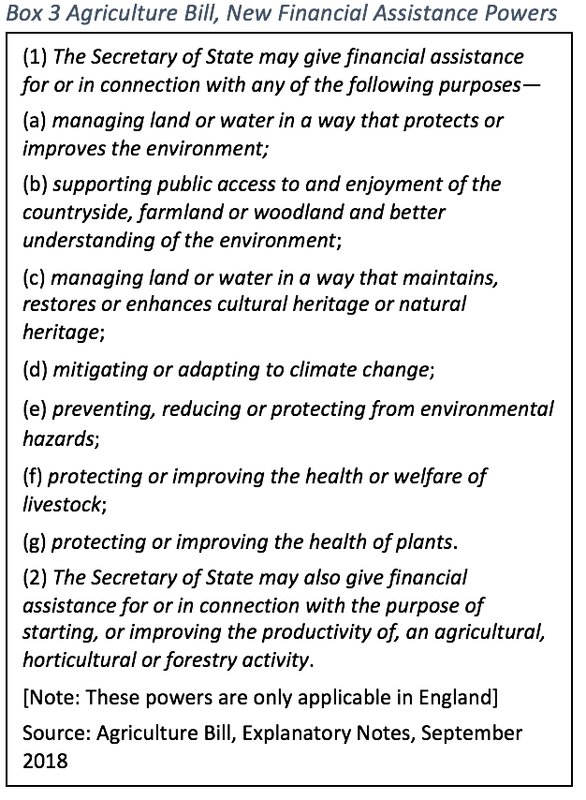 The objective is to stimulate UK farmers to produce agricultural products and environmental public goods, such as biodiversity, clean air and landscape for all to enjoy as sustainable businesses (for a definition of public goods see Box 1). The Bill fulfils part of DEFRA’s ambition of shaping a competitive and productive farming sector that “plays a crucial role in our food chain, and provides the majority of the diet for the country’s population”, enhance exports of food and drink, and improve air, water and soil quality, as well as bio-diversity and help with climate change. 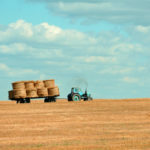 This short paper first provides a brief background to the agricultural and food industry in the UK, introduces the Agriculture Bill and provides an initial critical analysis. Agriculture is a small sector in the UK economy, contributing less than 1% to GDP and employing around 1.2% of the workforce. But these small numbers hide the important role of agriculture and food production for our economy and society. The sector produces about 60% of the food consumed in the UK (in calories) and manages 70% of land. The food processing industry is the largest manufacturing sector (20% of manufacturing). According to the Food and Drink Federation the industry employs 400,000 people in the UK, out of around 2.8m in the overall manufacturing industry. Food is an important product for households. 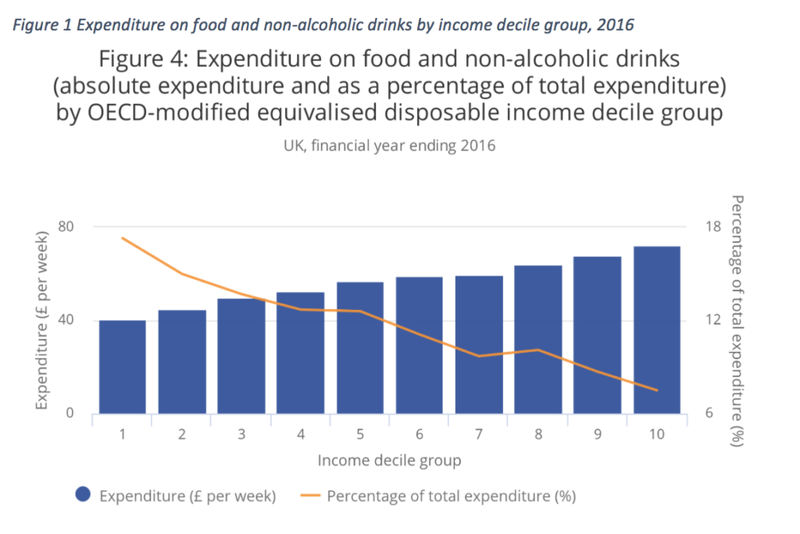 On average UK households spend around 10 to 12% of their income on food, but this varies by income group. The lowest decile income group spends closer to 18% on food (see Figure 1.) making households sensitive to price changes. Note: Absolute expenditure and as a percentage of total expenditure. 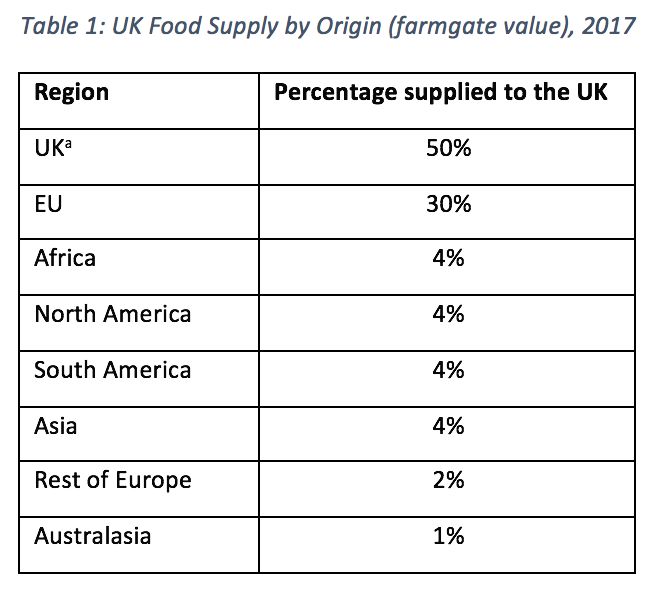 It is important to note that around 50% of UK food (measured in farmgate value) is imported. Many of the processed foods we buy in supermarkets include cross-border elements in the supply chain, ie ingredients may have been exported and reimported as part of the manufacturing process. 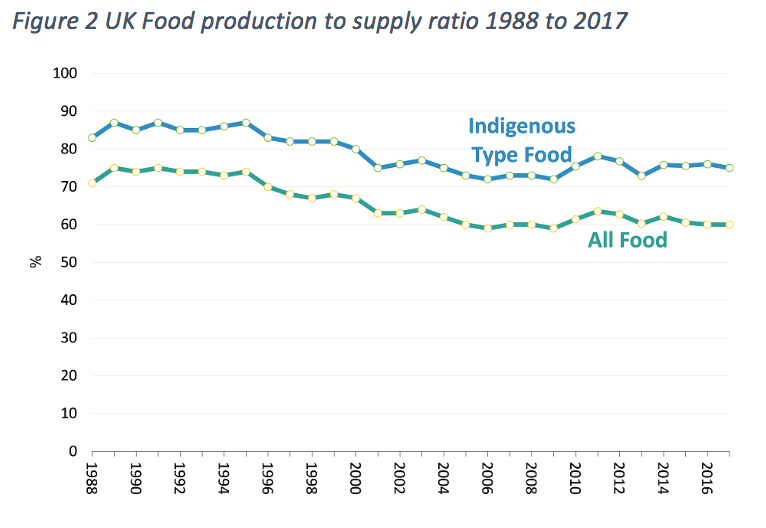 Figure 2 shows the share of food imported into the UK in total and the share of indigenous type products imported between 1988 and 2016. It demonstrates the dependence of the UK on imports of food. The average of a 50% import of food includes large differences between sectors. For example, the UK produces 90% of the poultry used in the UK, 115% of the Barley, but only 57% of fresh vegetables. The share of imports varies significantly by year, depending on many things including the local weather, relative prices etc. This means trade allows relatively constant supply even in times when low rainfalls or other effects reduce domestic production. Note: The figure shows shares at farm gate value including for exported produce. Table 1 shows that the EU is the largest supplier of food to the UK followed by Africa, North and South America and Asia. Although the share of agricultural products in world trade is small and falling, food is still a critical product within trade by providing for specific needs of a country such as the UK. It requires international trade to work with as few hold ups as possible to avoid the perishing of fresh produce. The Government’s 25 year environmental plan sets out the objectives of the Government for the environment and the steps to be taken to leave it in a “better state than we found it”. Due to the large share of land managed by farmers and the use made of ecosystem services they have a significant impact on the environment. 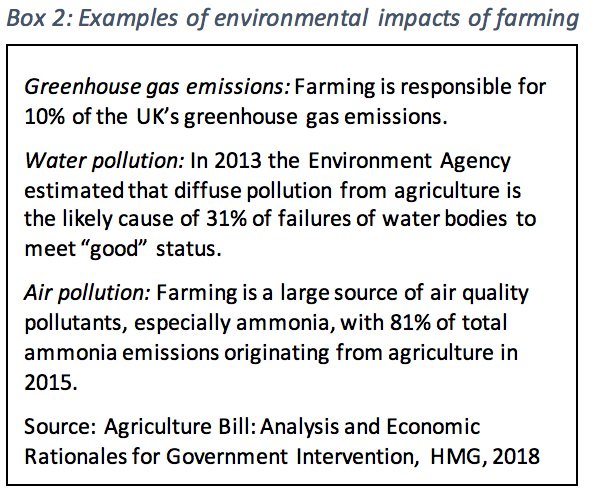 Box 2 provides some examples of the negative externalities caused by agriculture. 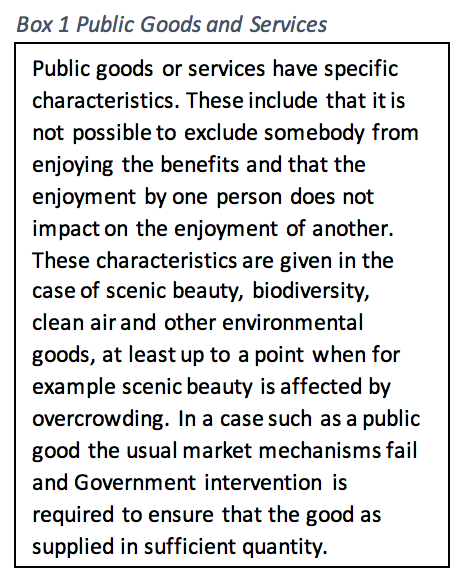 The externalities reduce the value of public goods the whole of society aims to enjoy. The Agriculture Bill discussed in this paper proposes to pay farmers for the provision of public goods as a service provided to society. These public goods include positive effects such as the creation of landscape and the reduction in environmental impact of farming. But it is not clear at the moment how the payments will be made and how the delivery of the goods paid for will be monitored. In a scenario where agriculture’s contribution to achieving environmental objectives is to reduce its own externalities incentives play an important role in achieving the desired outcome. As pointed out by Dieter Helm, the rationale for subsidies or payment for the delivery of these services remains unclear given that normally the response would be to regulate or tax the adverse practices. In addition externalities caused by farmers need to be strictly separated from the public goods produced because these two objectives required different policy measures. The creation of public goods, such as maintenance of landscapes, could be paid for directly as long as clear definitions and measurements of quantity, quality and value are possible. However, it is not clear whether farmers productive in food production are the same as those who will be productive in the delivery of environmental goods. 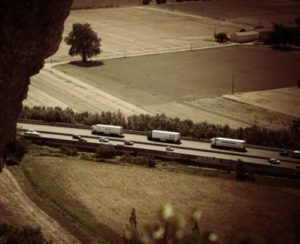 It is not even clear how much of a trade-off there is between environmental friendliness and productive efficiency and whether liberalisation of the sector and trade with non-EU countries will allow for the delivery of “public goods”. 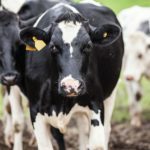 Recent research published by Nature Sustainability questions main stream thinking on what environmentally friendly agriculture could look like: New findings suggest that more intensive agriculture might be the “least bad” option for feeding the world while saving its species – provided use of such “land-efficient” systems prevents further conversion of wilderness to farmland. A given amount of production of milk or meat for example can be achieved either in an extensive and organic manner, using large amounts of land or in an intensive production process, minimising land use and allowing for a more controlled approach to the environmental impact. The costs for the measures as well as the tradability of the output and its competitiveness on the international markets will be affected. The Agriculture Bill is mainly an enabling Bill, including giving powers to the Secretary of State for DEFRA to provide financial assistance to farmers for a number of purposes including land management, mitigation of climate change and animal welfare. Box 3 summarises these. It allows sufficient flexibility to adjust policies once the final Brexit deal has been signed and any other relevant agreements have come to a conclusion. This leaves a lot of uncertainty for farmers and environmentalists alike at least in the short- to medium-term. However there are a number of important commitments in the Bill, which will determine the shape of agricultural policy as well as related trade policy. Transformation of agriculture policy through the Agriculture Bill by paying farmers and land managers to deliver environmental goods. Reform of Direct Payments currently going to famers based on the size of the farm moving to a system of payment for public goods. These two commitments are to be delivered without substantial impact on the overall English agricultural production. UK farmers currently receive significant subsidies from the EU CAP. This has clearly led to a distortion in the UK market, including the price for land. Subsidies tend to drive up land prices. This has increased the net wealth of farmers, but made the entrance for new farmers extremely difficult. Work conducted by the OECD in 2008 provides an overview of the literature on the link between land prices and agricultural subsidies, showing a positive relationship between the two. This is supported by theoretical studies that demonstrate that subsidies drive up demand for land and thereby its price. Moving away from land based support for farmers to payments for environmental services does not get away from this relationship completely. It will still be only farmers and/or other land owners who will be able to deliver the environmental public goods. I.e. the subsidies will be linked to land ownership, albeit for the delivery of a different good or service than has been the case so far. It is not clear from the policy documents and data how this will play out on a regional level and what the distributional impacts on different farms will be. Holding back increases in productivity and structural adjustments. Leading to overinvestment in inefficient farms. Analysis of the anti-competitive effects of direct payments as farmers can rely on the payment without having to compete. The removal of direct payments is expected to reduce land value and therefore costs such as rent. This could have significant effects as 37% of land is rented to tenant farmers. Removing payments is expected to lead to a small reduction in livestock and slight rise in agricultural prices but these will be small “because the trade regime essentially determines UK agricultural prices”. The conclusion of the analysis conducted by DEFRA is that leaving the CAP presents opportunities for the UK to address some of the inefficiencies generated by the CAP and perhaps, more ambitiously, to address efficiency issues not addressed by the CAP to date. This includes the potential for improvements in productive efficiency but also allocative efficiency by correcting market failures linked to the environment. Paying farmers for the delivery of public goods to correct market failures, ie the avoidance of external effects such as those described in Box 2 is a new direction of policy. While Pillar 2 under the CAP enables Member States to support environmentally friendly farming practices as well as other activities which increase rural productivity, it is not clear how these new payments to farmers will be funded, monitored or what their effect on trade agreement is. Four aspects of policy making have to be considered: design, implementation, monitoring, and impact. Policy design has to ensure that UK agriculture stays competitive internationally and its production affordable for UK consumers. According to the analysis publicly available the policy relies on the existing trade regime and prices are set in global markets. However it is not clear how it will address the potential risks inherent in this for UK farmers as they move to the new support system. So far it is not clear how the environmental aspects of the policy will be designed. It will be important to separate the positive support for the environment from payment for the avoidance of negative impacts caused by farmers and the potential perverse incentives arising from this. Policy design as well as policy implementation will require definitions of environmentally friendly farming in order to support the best practices. This is currently not available. 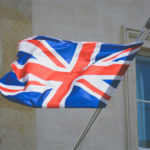 Policy implementation will impact on the type of product produced in the UK and its quantity. So far it is not possible to say how the changes to policy will play out in the UK agricultural sector. It is not clear at the moment which mechanisms the Government plans to use to achieve the environmental objectives. Paying for the delivery of public goods will require regulations or standards, a clear descriptions of what the public goods are, how they will be measured etc. There may be market oriented solutions, including the payment for natural capital or ecosystems services as they are delivered. Implementation (and design) will need to consider the links to existing trade agreements, impacts on future trade agreements and the link between Free Trade Agreements and environmental policies. Implementation will also need to consider the effects on the cross border supply chain to ensure this is not interrupted due to regulatory barriers. The implementation will have a direct impact on monitoring requirements. Standards will need to be enforced, quality and quantity measured. Monitoring will also need to be able to assess the regional and distributional effects of the changes. The existing systems used for reporting to the EU may be useful, but other measures such as self-regulation could also be tested. Distributional issues (and political economy issues) which may constrain the drive for efficiency. The analytical paper only touches on them. The implementation will have an impact on the amount farmers produce, on the number of farms as inefficient farms will no longer be supported by subsidies and other factors. Impact on food prices: This may be masked by other changes, such as the exchange rate. It is too early to draw firm conclusions on the question how the Agriculture Bill will affect the UK farming industry, the environment or UK trade in agricultural products. On trade, a possible conclusion is that given the small size of the sector, the relative small size of the UK in the world market and the fact that the UK is a price taker for most products, apart from fresh seasonal local produce, that there will be very little impact in aggregate. However, this is likely to hide localised impacts on farms in areas of marginal productivity, which benefit from CAP payments, and on those households for whom the cost of food is a higher than average share in household spending. If the policy is successful, productivity is expected to increase and some inefficient farms may go out of business or will be taken over by larger ones. This could have positive impact on structural change and competitiveness of UK agriculture with potential benefits for low income households by reducing some food prices. In short, we cannot predict how the Bill and future trade liberalisation will work together. Trade liberalisation may generate forces that push low productivity but more environment friendly farms out. If this was the case, the Bill would need to do more to ensure they were able to stay in the market. But it could also be the case that the more intensive farms, which are usually higher productivity ones, may also be better for the environment. In this case the Bill’s environmental outlook and trade liberalisation complement each other. Dr. Hotopp was formerly the Chief Economist at DEFRA. She is currently honorary professor of economic policy at the University of Kent and Chief Economist at Simetrica. With many thanks to Prof Sophia Davidova, School of Economics, University of Kent. Indigenous type products are products which are also produced in the UK such as potatoes, lamb, apples etc, compared to products not produced here such as mangos, avocadoes etc. These figures are net of intra-industry trade, ie poultry is imported and exported. Source: Agriculture in the UK, 2017. To assess the impact will require complex simulation models which are not available at this stage. 20% of farms have a negative profit margin, Source: Farm Business Survey, as presented in HMG 2018.